Songs of 2010: “Heaven’s on Fire” | Chickens Don't Clap! An mp3 blog that WON'T kidnap and kill you! I recently wrote a few blurbs for Treble‘s “Top 50 Songs of 2010” feature and wanted to post them, along with accompanying mp3s, for you all here. When I’m done I’ll be sure to post a complete list of my 50 favorite songs from this year. Let’s not beat around the bush — the Swedes know to make pop music. From ABBA, to Ace of Bass, The Cardigans, Robyn, The Hives, The Concretes, The Knife, José González, The Tough Alliance, Peter Bjorn & John, and others, Swedish mainstream and indie pop is populated by an increasingly diverse blend of artists that have enjoyed their own degrees of international success. The Radio Dept. fit comfortably on the fuzzier side of Swedish pop, but have had a fairly reserved fifteen year career, putting out just their third full-length in 2010. However, with songs as catchy as “Heaven’s on Fire”, the distance between their release seems irrelevant. Opening with a sampled call-for-rebellion from Sonic Youth’s Thurston Moore (“…I think we should destroy the bogus capitalist process that is destroying youth culture”), this second single from Clinging to a Scheme is all melancholy sweetness from there on out. 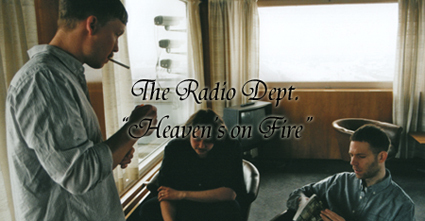 Not forgetting the most important pop mantra — hooks, hooks, and more hooks — The Radio Dept. provide accordingly with catchy lo-fi synth, bubbly guitars, prominent bass riffs, somber piano, sax solos, and breezy Balearic drum loops. Endlessly listenable and downright addictive, this song is one of the strongest in the whole of the current, saturated Swedish pop scene. And that’s saying something. Buy: Pick up Clinging to a Scheme over at Insound or eMusic. This entry was posted in From The Balboa Bay Window (Published Reviews), Young People's Music (mp3s and streams) by Derek. Bookmark the permalink.